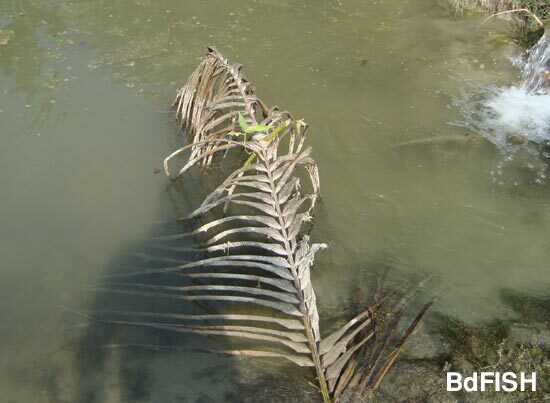 A case study is conducted on Gaora village of Charghat Upazila of Rajshahi to visit a carp-prawn polyculture pilot project, which added a new achievement in the aquaculture sector of the northern Bangladesh. 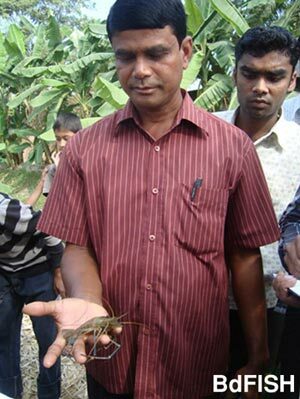 During the case study, the very first prawn farm owner at Charghat, Md. Abul Kalam Azad, who take a risk to apply this experimental culture system for North-western Bangladesh, focus light on the farming practice. The farmer starts farming activity from June to November. The farm was about 15 decimal. Farmer himself is the land owner, so there is no additional lease cost here. During preparation of rearing canal (at the end of May) farmers used lime (1.5 kg/decimal) with the aim of eliminate soil toxicity and remove unwanted fishes. The farmer also added Urea (350g/deci), TSP (350g/deci) and Cow dung (2.5kg/deci). The farmer build shelter by coconut leaves for the growing PL and for the safeguard of prawn during molting. After preparation of the rearing canal, they stocked PL (3-5days) at a rate of 3500 piece/15deci. Farmers delivered gold pre-nursery grade prawn meal as supplementary feed at rate of 200g/1000 piece/day for the first two weeks and from third week to 7th week the rate increase 300 g/1000 piece/day by broadcasting or feeding tray method. To make sure good returns from aquaculture, stocking of quality seeds is one of the most important issue. The farmers collect PL from Adomdighi Hatchery of Naogaon district, due to availability. PL were transported in oxygenated poly bags through microbus. They collect carp seeds from local hatcheries and fish seed dealers. Farmers incorporate 4 species of native and exotic carps mainly Rohu (Labeo rohita), Silver carp(Hypophthalmicthys molitrix), Bighead carp (Aristichthys nobilis) and Grass carp in his farm with prawn assigning the hope of proper utilization the entire tropic levels of the water bodies and generally carp species are stocked one to two months later stocking of PL. In semi-intensive system, farmer stocked 20piece of Rohu,40 piece of Silver carp, 5 piece of Bighead carp and 2 piece of Grass carp (about 200g sized seed) respectively. 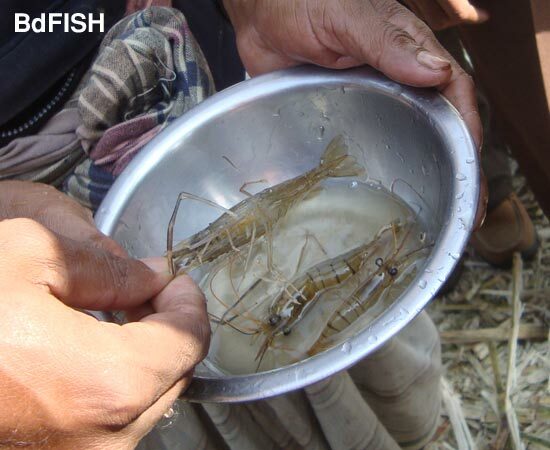 From the 7th week, farmer delivered Starter-1 formulated feed to the prawn at a rate of 3kg/day for 2weeks. From 10th week, farmer delivered Starter-2 formulated feed twice a day (early morning and evening) at a rate of 3kg/day for next 15 days. The farmer purchase formulated feed from markets of Bogra district. For the carp they delivered formulated feed, coconut oil-cake, wheat bran etc. at a rate of one third of the total body weight twice a week in ball form feeding method. Farmer supplied water through a submersible water pump if water level reduced from 2-2.5 feet. Net fencing around the farm and regular monitoring was done to protect the harvest. 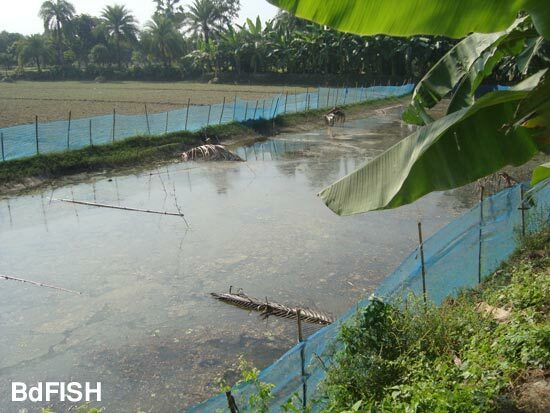 After a period of 5 – 6 months (June to November) rearing when most of the prawn and carps attain weigh 80 -100 g and 700 – 850 g respectively, farmers starts harvest their crops with cast nets by professional fishers. During these months, the water level of the farms became lower, making easy harvesting. Most of the farmers sell their crops in the depot where the post harvests care also taken. The production was total 250kg/6months/15deci and the CBR was 1:0.8. Returns from prawns depend mainly on the three factors such as actual production of prawn, cost of production and sale price of prawn. Economic returns (Tk/decimal) from prawn will be very profitable in future if prawn become a market penetrating product in markets of North-western region. 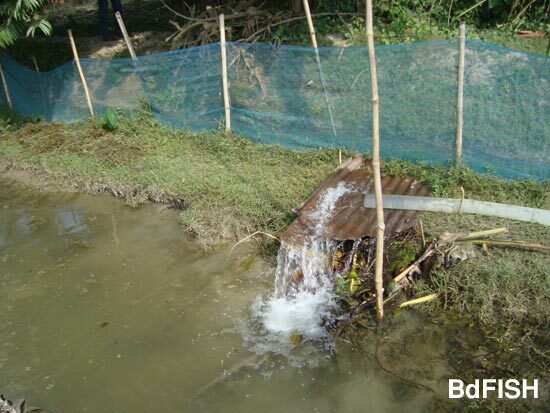 Some problems were identified connected with carp-prawn polyculture of locality; those were listed under three groups such as input problems, economical problems and drought problem. With the increasing of prawn farming area and the intensification of culture system also demand for fry and other inputs mainly supplementary feeds are increasing faster. Most of the prawn farmers along with the surveyed locality mainly depended on local hatchery for fry but the supply was insufficient to their demand. Besides this, farmers have bitter experience of stocking prawn fry from hatcheries. According to the farmers of that area, survival and growth rate of hatchery fries much low. On the other hand, at present the price of supplementary feed is very high because there is no local supply or manufacture of formulated feed in the north-western part of Bangladesh and often the farmers have to rely on the feed wholesalers at a high rate of interest, resulting in a small amount of profit at the end of the year. Again farmers of the locality have faced an unfavorable situation like price reducing of the prawn. Prawn have not popularly introduced as food for regular consumption in this region. People exclusively consume prawn because of its high price and seasonal availability only when prawns are imported from the southern region of the country. That’s why the market demand of the prawn is not up to the expectation. Government should establish prawn hatcheries at every major farming sites of northern Bangladesh to fulfill the demands of quality prawn fries. Government should establish aqua feed industries at the major farming sites and should supply low cost protein supplementary feed to the farmers. Credit for fisheries is not institutionalized. An appropriate system to provide credit with low interest rate from institutional sources must be established. Government should take positive steps to train up interested farmers and peoples to introduce proper technologies of prawn farming. Visited 1,181 times, 1 visits today | Have any fisheries relevant question?